How appropriate that I’m writing this as Interbike, our industry’s major trade show, is beginning. 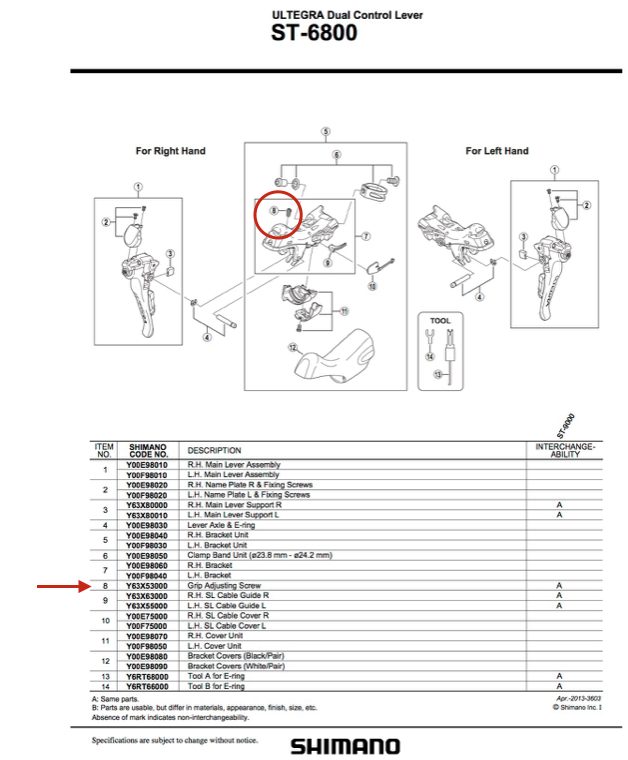 I hope all the product managers who oversee the design of small brake levers will read this. Let’s face it: there’s a dearth of small brake levers available for dropped bars. Yes, I know integrated brake/shift levers are hogging some of the real estate since they incorporate a lot of “innards.” Shimano does have a reach adjusting screw in their levers (can’t speak to SRAM since I’m not as savvy about their line), but…is it enough? More on that later. How about just plain old brake levers that don’t have any shifting capabilities — ones that just actuate the brake itself. Some manufacturers have “ergo” levers that are supposedly downsized for small hands, but when one is trying to design a bike for a rider with truly small hands, these are still a reach (no pun intended). Thank goodness for cross top brake levers — they may be the only things stopping the bike. I started searching for small brake levers even though I knew none were to be found. In the process, I found this delightful thread on the Cycling UK Forum from (!) 2011. Thank you, JonMcD, who offered a thoughtful, analytical look at the difference in size between his two Tektro levers — one the Junior Road Racing lever and the other a “standard” Tektro R200. Surprise! No real significance in reach and none at all in the hood size. Amazing — it’s now five years later and we still have no solution. But JonMcD made me think about how the industry could give us hard, cold numbers about the size of their small brake levers. Words like “junior”, “ergo”, etc. just don’t cut it. And asking a tech person to tell me the distance from the front of the lever to the back of the handlebar is an apples to oranges comparison. Where is the lever mounted on the bar? What kind of bar — anatomic, round…??? All of these things will affect the reach. 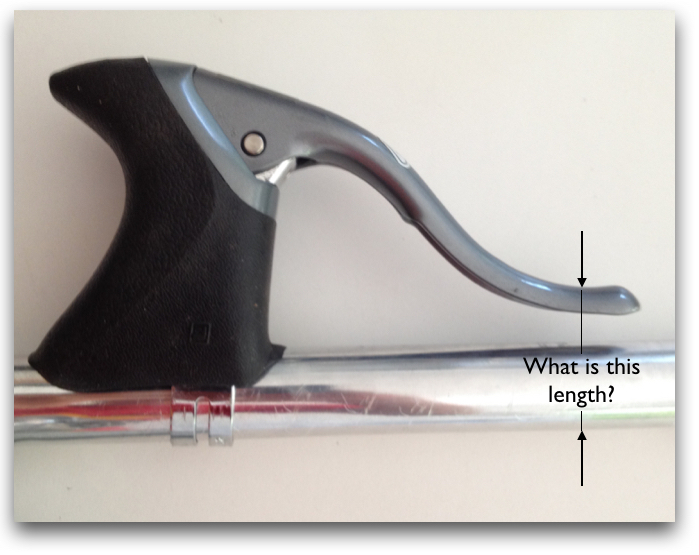 So, dear industry, how about establishing some criterion that will let bike designers compare brake levers? Here’s my idea. Mount the brake on a straight piece of tubing. Then publish the measured distance between the tubing and the nearest part of the the lever. Granted, this tells us nothing about the reach of the lever when mounted on a handlebar, but it gives us a good idea of how levers stack up against each other. 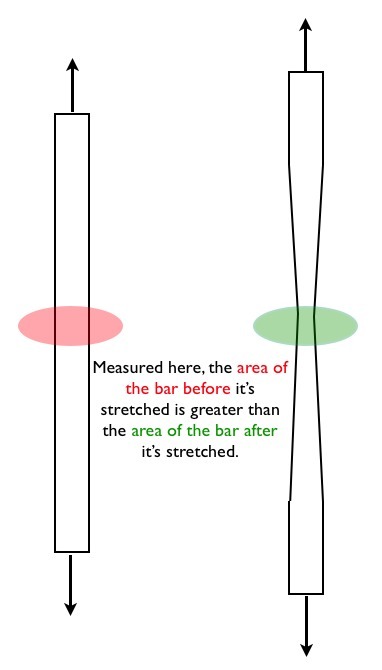 And with this information, it’s not difficult to approximate the actual reach of the lever on a handlebar. Now, about that adjusting screw in Shimano’s “brifter.” One of the sources I checked while looking for a small lever was Islabikes. Don’t know Islabikes? It’s the company founded by Isla Rowntree, well-known in the U.K. for her cyclocross achievements — British National Cyclocross champion for three years and British Veteran Cyclocross champion for two years. She saw a huge gap in the market for children’s bikes — the need for lightweight, serious machines. With that in mind, Islabikes was born. Islabikes uses Shimano brifters on their Luath Pro series of bikes. They’ve replaced the stock reach adjustment screw in the brake/shift lever with a longer screw so the lever can be snugged in closer to the handlebar. I’m not necessarily recommending this, but just sayin’ … why doesn’t Shimano do this? The screw that adjusts brake reach. Frustrating — but some enterprising company will look upon this as an opportunity. “If you build it, they will come.” It’s never failed. Anyone up to the challenge? 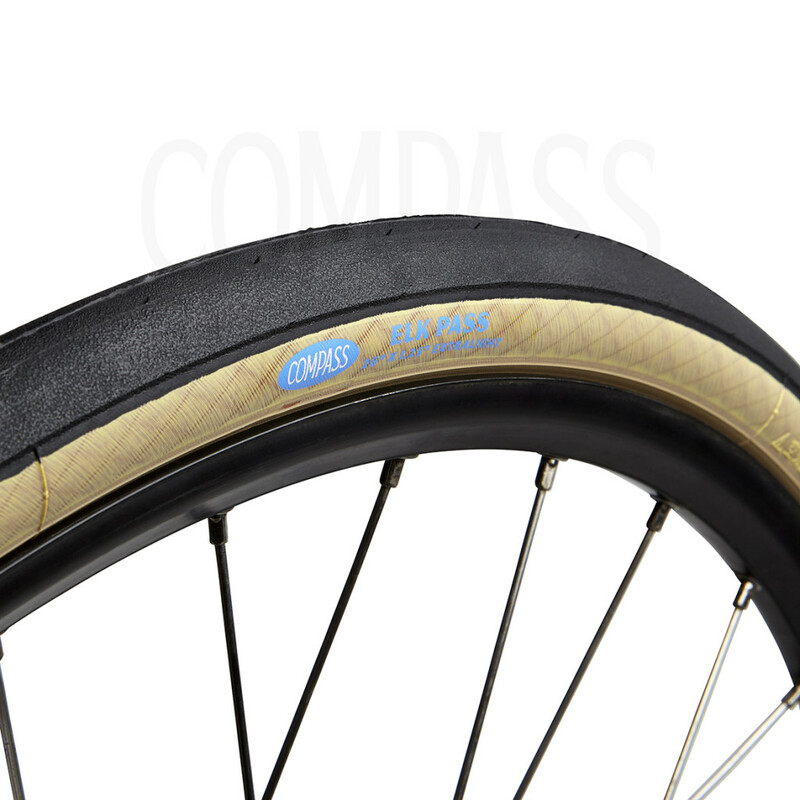 Compass Bicycles recently introduced a new 26” x 1.25” (32-559) tire, the Elk Pass. I purchased a pair to see if they would live up to my expectations. After riding them for over 700 miles on paved and dirt roads, I can honestly say the Elk Pass is the best tire I have ever ridden. The Elk Pass has a very light casing and a sticky tread. Actually, there is no tread in the traditional sense— this is a slick tire. At 178 g (6.3 oz), it is also a very light tire. Compare it to the 32-559 Panaracer T-Serve and 28-559 Schwalbe Durano used on the Coto Doñana Tour and Coto Doñana Vagabond. These tires weigh 260 g (9.2 oz). I mounted the Elk Pass on Velocity Aeroheat wheels. The fit was excellent, as I would expect from Panaracer (who manufacture the Elk Pass) and Velocity: two companies known for the quality of their products. I used the Schwalbe SV12A inner tube, which is a perfect fit in the Elk Pass — not too big and not too small. On 24 mm Aeroheat rims, the width of the Elk Pass measured 28 mm. The first clue that this tire was very special came as I walked my newly shod bike through the house on the way to its maiden voyage. It seemed to roll effortlessly. Once I was on the bike, I understood what it means to ride a superbly comfortable tire. The supple sidewalls soaked up road vibration the point that I almost felt like I was riding on a glass surface. Acceleration was immediate because of the low weight of the tires. I really didn’t want to get off the bike. For those of you who wondered where I was for most of October…well, I was riding my bike! But the most interesting revelation was how the tire affected the feel of the bike. I admit that the Coto Doñana Tour has always been a little stiff for my light frame. I would not describe this bike as one that “planes” for me. But the Tour’s personality changed with the Elk Pass. The bike felt like my Coto Doñana Vagabond and Gale Force — two bikes which definitely plane. So what’s the catch? Well, the Elk Pass is a lightweight tire. Suppleness comes at a price. It is less puncture resistant and more prone to wear. I wiped the tires regularly while riding. After each ride, I wiped the tires down and checked for nicks. The front tire is in mint condition — the mold marks are still well defined and there are no blemishes. The rear tire has suffered four small cuts. I gently pried out the offending flints. The mold marks have started to fade. No surprises here — the rear tire takes the brunt of the ride. I weigh 90 pounds. A heavier rider may find the tires wear more quickly. Jan Heine, the owner of Compass, recently rode the 700C x 32 Extralight Stampede Pass tires on tour. Jan weighs a lot more than I do, but reports that the tires performed very well. That says the tires weren’t made just for featherweights like me. But ride them for what they are: a tire that is designed primarily for comfort and efficiency, not for puncture resistance. At first, I wasn’t sure I would want to make this tradeoff, but after 700 miles on the Elk Pass, I’ve changed my tune. The Elk Pass tires are offered as an upgrade on the Coto Doñana Tour and Coto Doñana Vagabond. Depending on where you live, your bike could be in storage for as much as 6 months. If you store it in a garage or shed, cover it with an old sheet or tarp to keep the dust off. Hanging it up so that the wheels are off the ground will keep the tires from taking a set as they slowly deform from declining tire pressure. I prefer to keep the bike in a horizontal position. If you store your bike inside, in a place where you see it every day (and give it a fond pat on the handlebars), don’t worry about hanging it up. Just turn the tires a bit every week or so and pump up the tires every 60 days. That will keep the tires nice and round. You may have some electronic goodies on your bike. If they use rechargeable batteries, check the manufacturer’s instruction for the best way to store them for a long time. Should the batteries be fully charged prior to storage, partially charged or something else? Now, all you have to do is wait for Spring! A friend and I were riding the other day and joking around about how wind is “wind” in winter, but in summer, it’s just a “breeze.” Is that because we’re in better shape in summer, so wind resistance is easier to deal with? Undoubtedly, that’s some of it, but there’s more to it than that. Enter the Ideal Gas Law, which calculates the density (how much a volume of air weighs) of dry air as a function of its pressure and temperature. Dry air is air with no moisture content — zero humidity. Plugging some numbers into the Ideal Gas Law reveals that a cubic meter of 77º dry air has a density of 1.18 kg/m3 and a cubic meter of 32º dry air has a density of 1.29 kg/m3. Warm air is lighter than cool air. Air exerts a force against the bike rider which we refer to as wind resistance. How much force depends on air’s density (which we calculated above), the square of the velocity of the rider, the drag coefficient (based on the shape of the rider and bike) and the cross sectional area of the rider and bike. Everything else being the same, the wind resistance of 32º air is about 10% higher than the resistance of 77º air. So the perception that “wind” morphs into a “breeze” as the weather warms up is real. Here’s something that’s completely counter-intuitive. Humid air is lighter than dry air. Read the informative blog referenced below for the reason why. Hmmm. This means that a hot, humid day is better for cycling than a cold, dry day…at least in terms of wind resistance. How many of us would opt for the hot, humid day? Not many! Humid conditions introduce a lot of physical challenges for the cyclist. They usually override the benefits of that lighter, faster air. But to the extent that we can acclimate to that kind of weather, the easier the cycling will be. Cycling and wind — fun things to think about the next time the wind or breeze blows! I hear from lots of women whose hands just aren’t strong enough to cope with tight fitting tires. It’s scary to think you might get stuck with a flat tire and not be able to get it off the rim. So much for a great pump or CO2 cartridges! When it comes to bicycle tire tools, it’s all about the leverage. Leverage! If ever there was a woman’s best friend, leverage is it! The dictionary defines leverage as a way to gain mechanical advantage. It’s also defined as the “power to influence a situation to achieve a particular outcome.” I think that says it all. The goal is to influence the tire to respond to your wishes. Leverage is best achieved through the use of proper tools. When replacing a tube, the first hurdle is coaxing the tire off the rim. Tire levers are the best way to do this. But not all tire levers are created equal. In order to pry the tire off the rim, the lever needs to be thin enough to squeeze between the tire and the rim. The business end of plastic levers tends to be too thick to be effective on a tightly fitting tire. My recommendation is to use the aluminum Minoura levers. Three will do the trick. Once the tube is back in place, there are two tools that can get the tire back on to the rim. The Kool-Stop® Tire Bead Jack tool is industrial, but gets the job done easily and quickly. 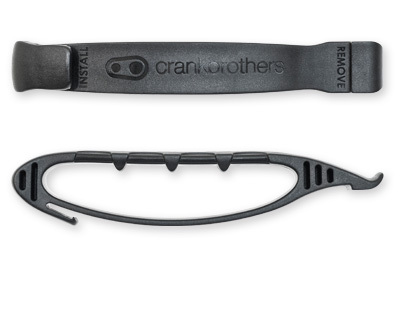 If you’re looking for something a little more svelte, consider the Crank Brothers Speedier Lever. Rather than jacking the tire onto the rim, it “slides” it into place. (This video demonstrates how to use the tool). The drawback with this method is friction — if there is a lot of friction between the tire casing and the tool, dragging the tool along can be difficult, if not downright frustrating. Only you can decide what the tradeoff is between carrying these tools and keeping things simple. Whichever you go with, try a practice run at home so you’ll be prepared when you need to use them. Enjoy the peace of mind that comes from using leverage! Before a customer purchases a bike from me, I ask her to complete a questionnaire that covers everything from measurements of herself and her current bike, her cycling aspirations and her flexibility. If you’ve followed the evolution of fitting techniques, you’ll know that flexibility is becoming as important as an inseam measurement in setting up a properly fitting bicycle. Achieving a “neutral” or flat back position can be difficult if the hamstrings are tight. These muscles attach to the pelvis at the ischial tuberosities (sit bones) and behind the knee joint. If they’re tight, they effectively pull down on the pelvis, causing it to rotate back. On the bike, this often leads to a rounded back, which can cause neck pain from rotating the head up to watch the road. The upside is that rotating the pelvis back reduces pressure on the sensitive “bits” that land on the front of the saddle. It’s easy to see how a rider who is flexible can have an advantage over a rider who is not as flexible, since the former will be able to get into a lower and longer position on the bike. 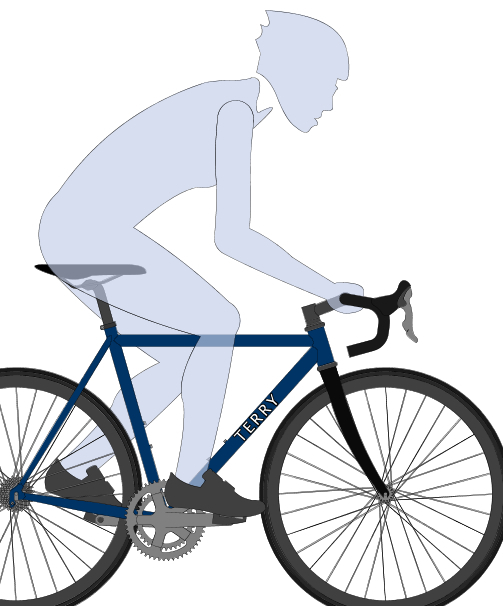 In this position, the rider is more aerodynamic and can generate more power than a rider sitting upright. The pelvis rotates forward, allowing the spine to settle into a neutral position, reducing the possibility of low back pain. The downside is that there is more pressure from the saddle on the rider’s crotch. 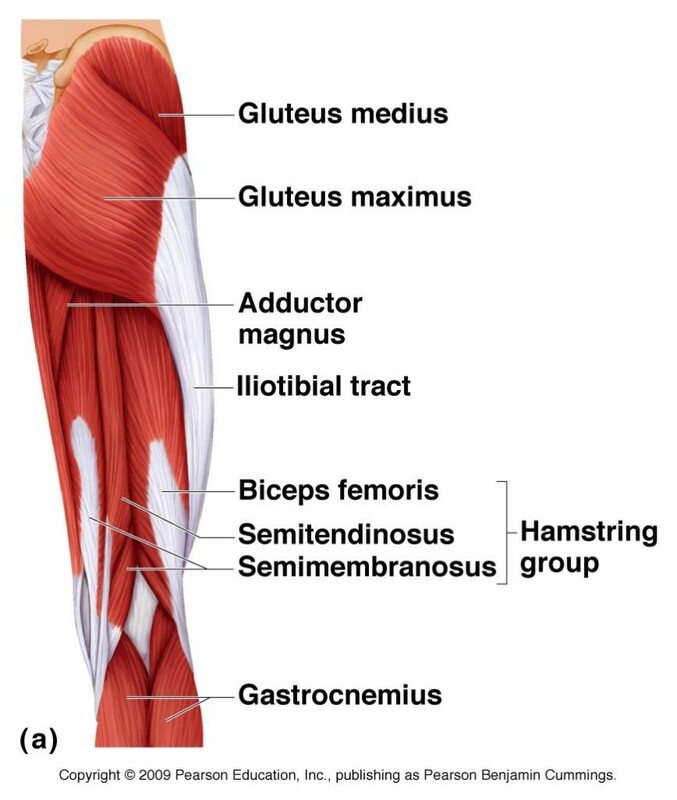 Jo McRae, a trainer in the U.K., distinguishes between the “upper” and “lower” hamstrings. She maintains that as a cyclist pedals the upper part of the hamstring, which connects to the pelvis, is stretched more than the lower end of the hamstring at the knee. As a result of this dynamic motion, the upper end of the hamstring tends to be more flexible than the lower end. Specific stretching exercises are needed to address that area. The correct saddle height can be determined through a variety of formulas. Hamstring flexibility, or lack of it, affects saddle height. A rider who has tight hamstrings might not feel comfortable with the saddle at the high end of the range, but this can be addressed by stretching to improve hamstring flexibility. Flexibility has a an important role to play in how the bicycle is set up most effectively for you. In the end, it’s up to you to decide what the proper trade-offs are between comfort and power. Lemond method: Set the saddle height at 88.3% of the inseam length. Measure from the center of the bottom bracket to the top of the saddle. Hanley method: Set the saddle height at 109% of the inseam. Measure from the center of the pedal spindle to the top of the saddle. Place the heel of the foot on the pedal when it’s at the bottom of the pedal stroke. 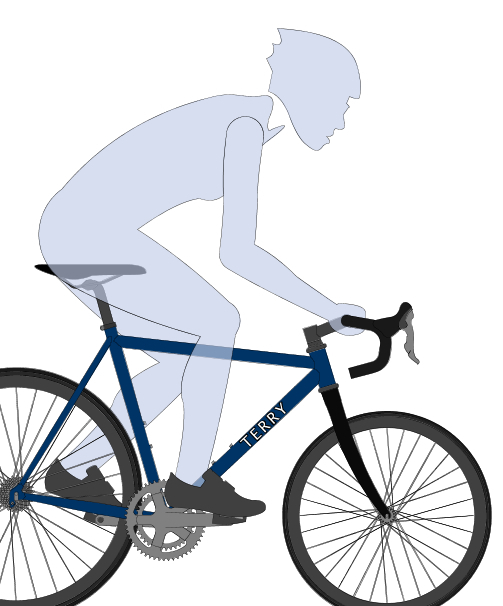 Set the saddle to the height at which the knee is locked.Measure the angle between the lower and upper leg at the knee at the bottom of the pedal stroke. Most experts agree it should be between 145º and 155º. This blog is also posted on Women’sCycling.ca. Recently I was contacted by a customer who was concerned that my bikes using a 24” front wheel/700c rear wheel design were flawed. Wouldn’t the design put pressure on the neck and shoulders because the 24” bicycle wheel made the front of the bike lower than the rear? Ah, if were only so simple as throwing a 24” bicycle wheel on a bike designed for a 700c wheel. If one picture is worth a thousand words, then four pictures must be even better. 1). Here’s a bike with 700c front and rear wheels. 2). If the 700c front wheel is replaced with a 24” wheel and no other changes made to the bike, the picture below shows how it would look. Not only is the bike very low in the front, but the brake pads are far above the wheel. The rider would definitely feel not only pressure on her hands and shoulders, but she would feel the thrill of no front brake! 4). Here’s the right way to do it. The head tube on this bike is much longer than on the bike using twin 700c wheels. This keeps the front of the bike in the proper position so the top tube is horizontal again and the rider is in a normal position. Compare this to the first picture. Bottom line: When a bike with a 24” front wheel is build this way, there is no design flaw. If the rider feels as though she is bearing too much force in her arms, the solution lies in tweaking the stem and handlebars. Saddle Height — What’s Right? 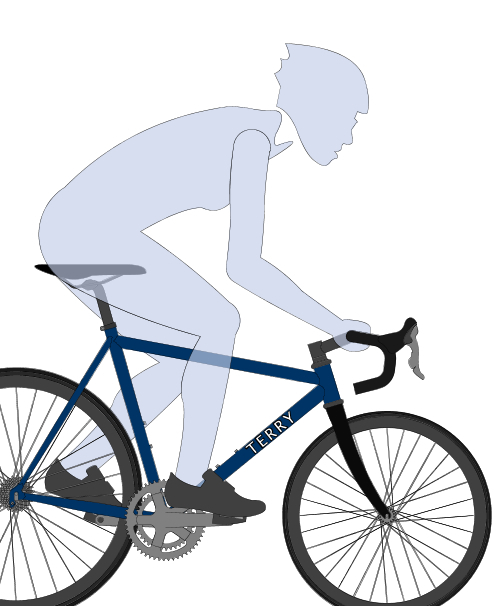 Finding the correct saddle height for your bike is critical for a good fit and healthy knees. Here are some popular methods. You’ll need to know your barefoot inseam for the first two. To calculate it, put a thin book between your legs with one side of the book against a wall. The book should exert firm pressure on your crotch. Remember to keep the book horizontal. Use a pencil to mark the wall at the top of the book. Measure the distance from the floor to this mark — that’s your inseam. 1). Multiply your barefoot inseam by 0.883. Adjust the saddle until the distance from the top of the saddle to the center of the bottom bracket is this length. 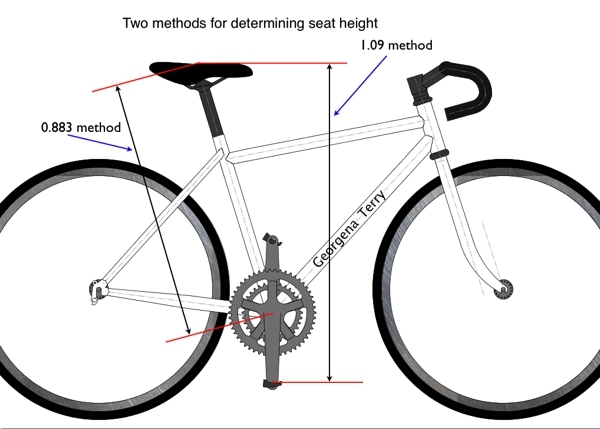 This method is a good starting point for setting your saddle at the right height, but it doesn’t take into account the length of the crank arms, the shoes you wear or the pedals you use. 2). Using the same barefoot inseam length, multiply it by 1.09. This should be the distance from the top of the saddle to the pedal platform, when the pedal is at the bottom of its stroke, not when it is in line with the seat tube. 3). Put your bike on a trainer and get into your normal riding position. Put your heels on the pedals and back pedal. 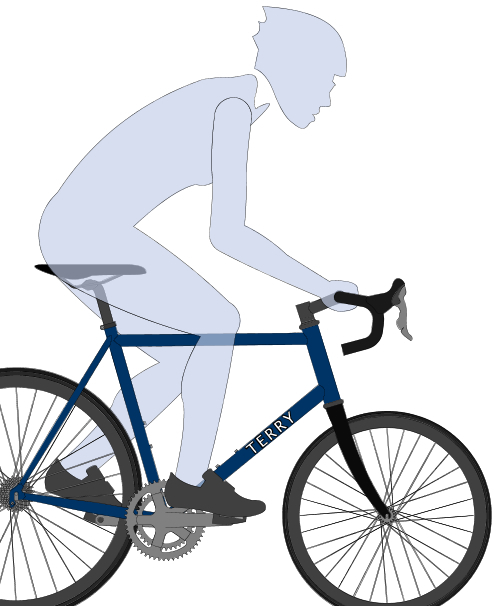 Raise the saddle height until you just start to rock side to side on the saddle, then back it down a tad. You can also just go for a ride on your bike to do this. With the sun at your back, you can watch your shadow to see when you start to rock. I can pretty much guarantee if you try all three of these methods, you’ll come up with three different saddle heights. The third method, though, is the one that will probably get you on the way to a good fit faster than the other two. That’s because it’s addressing the “real” you on the bike. A measurement is just a number; it doesn’t know if your build is slight or your feet are big. So start with the last method and set the saddle height. To tweak it from here, you’d be well advised to follow Andy Pruitt’s advice. He’s the hands down expert. When your pedal is at the bottom of the stroke he suggests a saddle height that will give your knee a bend of 150 – 155 degrees. Note that the angle of a perfectly straight leg would be 180 degrees. We want a slight bend to the knee. He uses anatomical landmarks to measure the angle, from the hip (greater trochanter) to the knee (lateral condyle) to the ankle (lateral malleolus). It’s tough for a novice to locate the landmarks accurately, so if you go this route, work with someone who can help you. What you’re ultimately trying to achieve is a position that won’t tweak your knees, those precious commodities that put up with a lot from a cyclist. When they aren’t happy about the saddle height, they’ll give you a shout and you’d best heed it. If your knees hurt at the front, try raising the saddle a bit. If the back of your knees hurt, try lowering the saddle a bit. Triaxial tension in a lugged steel bicycle frame. It’s an unexpected marvel of nature: the weakest chain in the link can hold its own with the stronger links. But this blog isn’t about chains; it’s about a lugged steel bicycle frame. In an earlier blog, I described the difference between a lugged frame and a TIG welded frame. This frame is primed and ready for painting. 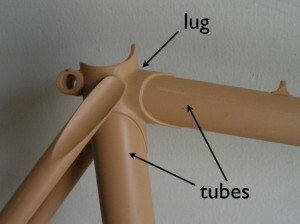 This photo shows the seat tube lug. When lugs are used as sleeves to join the tubes of a bicycle, everything is joined with a metal filler, usually brass or silver. When I built frames, I used a silver alloy metal. Silver will flow into the very small gap (from 1 to 5 thousandths of an inch) between the lug and the tube and, like glue, hold everything together. One way of measuring the strength of a material is its tensile strength. Very loosely speaking, tensile strength refers to how much force can be applied to a material before it starts to deform and “break”. All you need to know for this blog is that higher numbers mean stronger materials. An investment cast lug and steel tubing have a tensile strength of about 120,000 psi (pounds per square inch) and the silver alloy (the “glue”) has a tensile strength of about 70,000 psi. 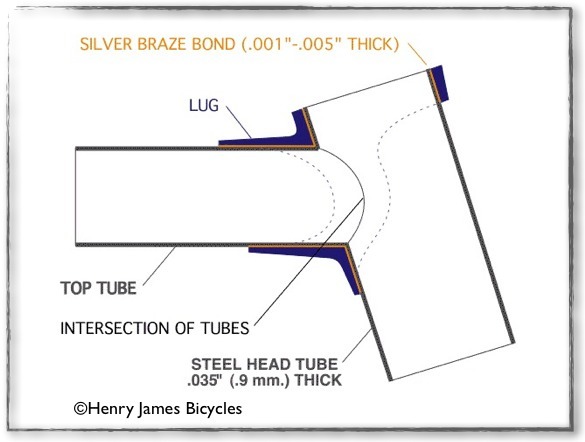 When the tensile strength of steel joints properly brazed with silver were tested, the joint was able to withstand a stress of 120,000 psi … even though the silver “glue” holding the joint together had a tensile strength of only 70,000 psi. How is this possible? The science behind this still isn’t completely understood, but it’s been hypothesized that the brazing filler material is so constrained by the lug and tubing around it that it can’t “slip” along the tiny, tiny little planes in its atomic structure. Because the brazing material is constrained by the lug and tube around it and has nowhere to go, its area can’t change. Materials engineers refer to it as being in a state of “triaxial tension”. Simply put, the effect of this state is to make the brazing material stronger. This is one of the many things that makes engineering and bicycles so fascinating. 1 Handy and Harman Brazing Technical Bulletin No. T-3, “Strength of Silver Brazed Alloy Joints”, pp. 1- 2. Steel Bike Weighing 9.6 lbs More Than Titanium BIke Climbs Just As Well! Did I get your attention with that headline? It was inspired by an article I read in the most recent issue of Bicycle Quarterly, a fantastic, niche magazine published by Jan Heine. In this issue, Jan tested a titanium bike against a steel randonneur bike. It was a real world test: two guys racing each other up the same hill, one on the ti bike, one on the steel. They swapped out the bikes several times. Both were evenly matched in terms of strength, endurance and weight. The weight of a steel bike is always of interest. This steel bike was 9.6 lbs heavier than the ti bike, but it climbed as well. It sounds implausible, but as Jan explained, when the weight of the riders was taken into account, the steel bike plus rider was only 5% heavier than the ti bike plus rider, but the steel bike “planed”, helping the rider generate the extra power needed to overcome the weight difference. Fans of Jan’s bike testing will know there is an advantage to a bike that “planes”. This is a bike that is in synch with the rider and flexes in a way that “gives back” some of the rider’s energy to the drivetrain. Just for fun, I backed through Jan’s math to calculate that he weighs about 175 lbs. I used my own 100 lb. weight in his calculations and found that the difference in weight plus rider for me is about 8%. Ah, we smaller riders have a rougher road to ride, do we not? A bike that planes is a must! The important point is that weight is not a big deal. Choice of tires and construction of the frame is though. Take the road less traveled — not only on your bike, but in your reading as well.